Camden, Maine, June 13, 2018 – Camden National Bank recently announced the Grand Prize winner of its spring sweepstakes, Swipe Sweeps. Kyle Veillette, a young man from Carmel, Maine, won $5,000 in May for using his debit card throughout the promotional period. Over the course of the two-month sweepstakes, Camden National Bank awarded 39 other customers with $100 each, totaling over $8,000 in prizes. The winning customers ranged from 20 to 78 years old and were located across Maine and as far away as Washington, D.C. to Washington State. 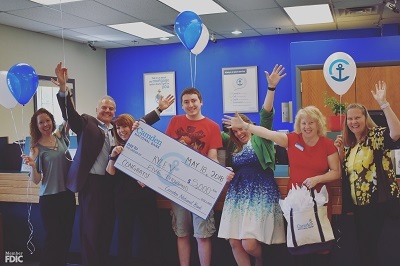 Kyle celebrated his big win at Camden National Bank’s Brewer banking center, and he let the staff know that he plans to save the $5,000 to invest in his future. He was incredibly grateful for the exciting surprise from his community bank. Camden National Bank offers a comprehensive array of financial products and services, complemented by personal service and the latest in digital banking technology. Their unique checking account offerings are especially known for providing cash-back rewards to customers on debit card purchases.